Book Review: A. Igoni Barrett's "Love is Power, Or Something Like That"
It's either I'm starting to like short stories, or this is a just a really good collection. 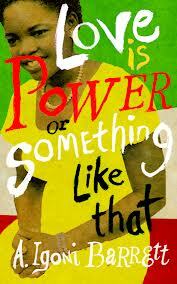 Out May, Love is Power or Something Like That is a new collection of nine short stories by A. Igoni Barrett. I would also like to say a big thank you to Chatto & Windus for providing me with a review copy. Nigeria forms the backdrop of this collection in which an ailing old woman, an internet fraudster, an impoverished young boy, a corrupt police officer, a commuter, a wealthy civil servant and a traveller all show us the different ways love, or "something like that" manifests itself. In the opening story The Worst Thing That Happened an ailing old woman, who has to make her way yet again to an operating room, travels across town to visit her daughter. But what she feels on arrival is abandonment in spite of "all the years she had given, the sacrifices, the worrying, the love" (p.16). In The Dream Chaser, all is not what it seems, as a young boy spends his days in a cyber cafe pretending to be a woman online. The Shape of a Full Circle, shows another young boy, but in different circumstances - he is responsible for his family. The title story takes us into the world of a corrupt, abusive police officer trying to understand his different actions as a police officer and a family man. My Smelling Mouth Problem tells of the daily troubles a young commuter faces getting around Lagos as a result of literally his smelling mouth. The Little Girl with Budding Breasts and a Bubblegum Laugh might be a mouthful of a title, but it tells of forbidden love. From pre-Independence, through Nigeria's many coup d'etats, the Nigerian Civil War, and even the "War Against Indiscipline" (WAI) a family's story is told in Godspeed and Perpetua. This isn't a rags-to-riches story, but one of a man who goes from being a wealthy senior civil servant to a lesser version of himself. Through it we see the impact all these events have had on him, his wife, and their relationship (with each other and also with their daughter). These different characters and stories show that whether real or fake, right or wrong, one thing that cannot be denied is love's presence in people's lives. Love really is power, or something like that, but what we do with it is an entirely different story. And one that I think this collection of stories captures quite well.